On April 16th 2015 IBEC was awarded the “HR Excellence in Research” award from the European Commission. The award reflects our commitment to continuously improve our HR policies in line with The European Charter of Researchers and The Code of Conduct for the Recruitment of Researchers. These two documents, created in 2005 by the European Commission, describe the rights and responsibilities of both the researchers and their employers and contribute to the creation of a labour market that is transparent, attractive and open to the researchers at an international level, as well as turning research into an attractive professional career. 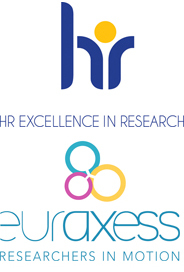 IBEC has adhered to the Charter and Code since 2012, and two years later, many initiatives aligned to the overall strategy of IBEC reflecting this decision have been developed, encouraging continual improvement in Human Resources issues and setting the scenario towards the application for the “HR Excellence in Research” accreditation. Human Resources Strategy for Researchers (HRS4R): What do you know about it? Watch this short video to see the main actions that are being implemented at IBEC. In June 2014 IBEC started designing a new Human Resources Strategy for Researchers (HRS4R) and Action Plan according to the Charter and Code. The HRS4R was designed with the purpose of implementing measures that all key players have expressed are important to them and that have been broadly accepted through the internal analysis process. · feedback from Group Leaders and Heads of Unit and regular meetings with the Directorate. The internal analysis aimed to compare IBEC’s practices against the Charter and Code principles. As a result, IBEC created an Action Plan which contains feasible measures with specific actions that we are sure will make a distinction in IBEC’s future. This action plan to implement the HRS4R was submitted and published on our website in March 2015. IBEC’s Action Plan applies to all staff categories and consists of 17 actions with different scopes: from short-term and hands-on actions to important and long-term ones significant to the progress of IBEC. All the actions included in IBEC’s Action Plan reinforce the overall aims of our Human Resources Strategy which consist in running a distinctive specialist training programme to attract international talent and providing a high-quality environment for our researchers. As part of the process of implementing the HRS4R according to the principles of the Charter and Code, IBEC commits to ensuring a self-assessment every second year, as well as an external evaluation every fourth year, in cooperation with the European Commission. One of the first measures of the HRS4R Action Plan was to set up a Gender and Diversity Committee comprising researchers at all career stages which is committed to analyzing equal opportunities and diversity topics. This committee produced the first IBEC Equal Opportunities and Diversity Management Plan to be implemented before the end of 2016. With the experience gained with the first Plan, as of 2017 the second Plan was created. Download the new Equal Opportunities and Diversity Plan 2017-2019 here. On July 31st 2017 IBEC published its self-assessment report and sent it to the European Commission for evaluation. This report contains information about the evolution of the HRS4R Action Plan and the status of each action, as well as new actions planned for the following years. To create the self-assessment report, a participative project took place with an internal survey, meetings with the Monitoring Committee of the Charter and Code and working groups as the one for the OTM-R Checklist (Open, Transparent and Merit-based Recruitment). The results of the internal survey can be found in the self-assessment report, as can an Annex with the OTM-R Checklist. The next evaluation will take place in 2020, and until then IBEC will continue to implement all the new actions.